Atomic EFI systems were designed to simplify the installation and improve overall performance. 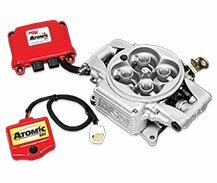 The Atomic TBI is designed to support up to 625 horsepower when used with the specified high horsepower fuel pump. Internal Fuel Rail-By integrating the fuel rail we were able to remove fitting connections to reduce the areas that a leak could develop (not to mention the enhanced appearance). ECU and Sensors-The ECU is integrated to the throttle body! This unique design reduces wiring and keeps your EFI installation easier than ever. The TPS, MAP, IAT and fuel pressure sensors are all incorporated into the ECU saving you wiring and connections. In fact, the only sensors you need to connect are the coolant temp and the wide-band oxygen sensors. Injectors-Fuel delivery is provided by four precision 80-pound injectors. These injectors feature a stainless steel ball and seat metering method for maximum internal sealing. For a secure mount the injectors are sealed between the housing and the cast fuel rails. TPS-The Atomic’s TPS is an automatic, self-calibrating, non-contact sensor. That means you don’t have to worry about configuring it during set up. Also, with no contact, there is nothing to wear out or replace. 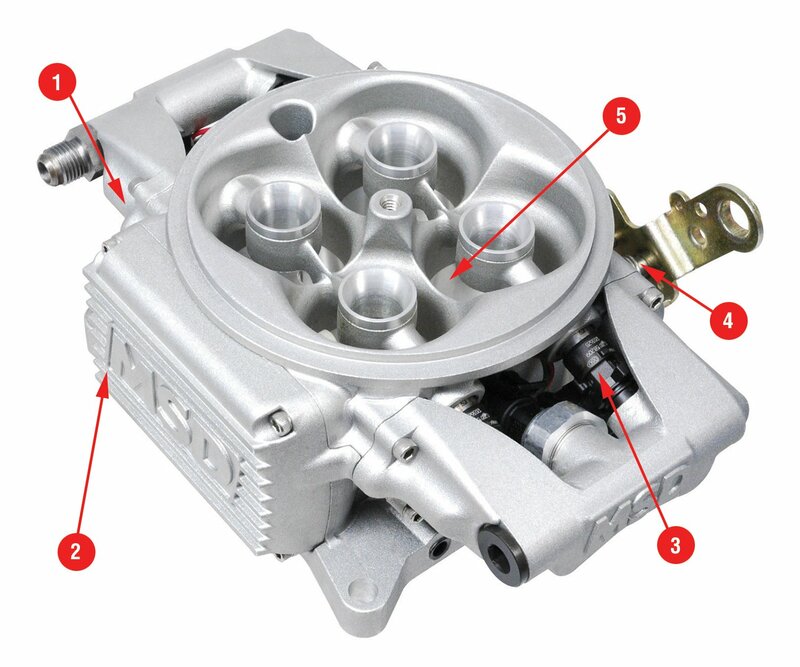 Mount and Blades-The Atomic throttle body will bolt in place of a standard square bore carburetor and accepts most common throttle and kick down linkages. The throttle bores are 1.75” diameter and each blade is supported with precision roller bearings for smooth pedal operation. 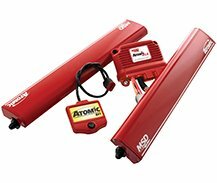 The Atomic EFI outshines the competition in ease of installation and performance! The MSD annular ring injection design produces an air/fuel charge with much better mixture as well as an even distribution among the cylinders that our competition cannot match. Better AFRs equal better idle quality, better starting, and better overall drivability throughout the rpm range. You and your engine will be glad when you Go Atomic. *We might be biased but really, look at them! "The engine starts and idles regardless of temperature. It doesn’t pop or sneeze if I drive it cold. 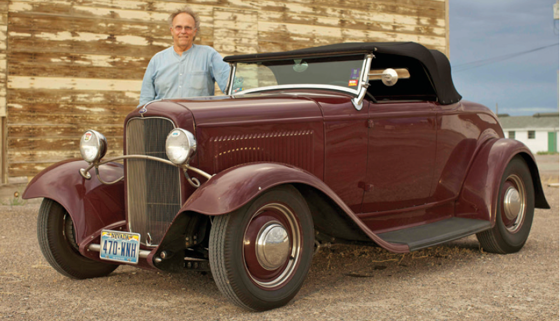 I can pull into traffic without praying the engine won’t stumble or lurch. It runs beautifully at the beach or on the Eisenhower Pass (11,150 feet) whether near freezing or on a 100-plus-degree day. Wide-open performance feels the same but the part-throttle response improved so much that you’d swear the engine got bigger. And if I can keep my foot out of it, it returns a consistent 15 to 20 percent improvement in fuel economy which was at a pretty respectable level beforehand. The even bigger reward was the excellent drivability that it provides. The roadster drives even more like a modern car now." Browse our technical documentation and downloads for information on Atomic EFI. Learn how to download and update your Atomic EFI.